Grow something completely different in your garden with this rare and beautiful plant. Feathery acacia like foliage and bears bright yellow flowers with orange-red stamens in late summer each one like a ball of feathers. Only borderline hardy so best grown in a large pot in a sunny spot and moved indoors for winter. Drought tolerant once established and generally problem free, ultimate height and spread is 4 x 2.5m. If you want to grow something different, then this is the plant for you. 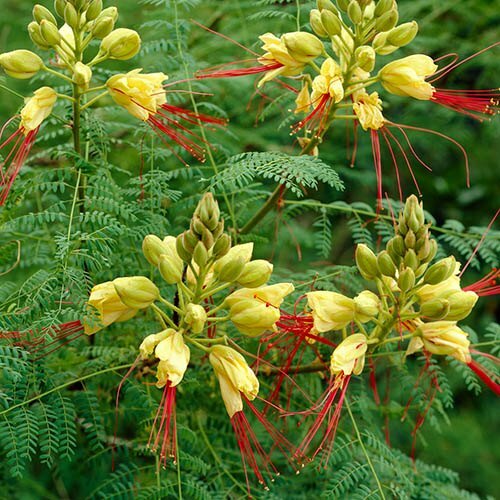 The Yellow Bird of Paradise (Caesalpinia gillesii), is a bushy shrub with a profusion of snapdragon-like flowers dripping with orange-red tassels. Caesalpinia goes by several other names, including the Desert Bird of Paradise and Crimson Threadflower - which give a hint to its drought tolerance and beautiful flowers. The yellow flowers reach around 2.5cm (1in) and are extended further, sometimes by as much as 7.5cm (3in), by the showy stamens. Produced on erect stems 15-30 (6-12in) long, the blooms are a favourite with humming birds in its native South America. Rarely sold or grown in the UK, Martin discovered it on a Spanish Nursery on a trip there recently, and bought all we were allowed to. With fine feathery foliage, like an Acacia, this bird of paradise (which incidentally is not related to the Strelitzia), is borderline hardy in the UK, so we advise protecting from frost in winter. Grow it in large pots in a sunny position, and enjoy its amazing flower displays in late summer. Caesaplinia easy to care for and generally problem free - plants under glass may need a restrictive prune after the first flush of flowers. Supplied as a set of 3 x 9cm potted plants, ready to plant out or repot. Keeping the plant well-watered will encourage flowering. Water regularly and apply a balanced liquid fertilizer monthly; water sparingly in winter. Pot on or top-dress in early spring.